Define and discuss nuclear decay. Explain parent and daughter nucleus. Calculate the energy emitted during nuclear decay. Some nuclides are stable, apparently living forever. Unstable nuclides decay (that is, they are radioactive), eventually producing a stable nuclide after many decays. We call the original nuclide the parent and its decay products the daughters. Some radioactive nuclides decay in a single step to a stable nucleus. For example, is unstable and decays directly to , which is stable. Others, such as , decay to another unstable nuclide, resulting in a decay series in which each subsequent nuclide decays until a stable nuclide is finally produced. 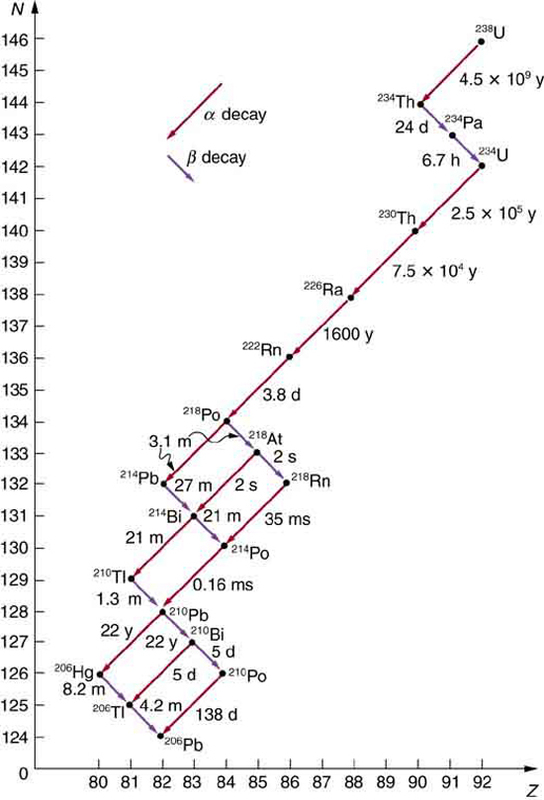 The decay series that starts from is of particular interest, since it produces the radioactive isotopes and , which the Curies first discovered (see Figure 1). Radon gas is also produced ( in the series), an increasingly recognized naturally occurring hazard. Since radon is a noble gas, it emanates from materials, such as soil, containing even trace amounts of and can be inhaled. The decay of radon and its daughters produces internal damage. The decay series ends with , a stable isotope of lead. Figure 1. The decay series produced by 238U, the most common uranium isotope. Nuclides are graphed in the same manner as in the chart of nuclides. The type of decay for each member of the series is shown, as well as the half-lives. Note that some nuclides decay by more than one mode. You can see why radium and polonium are found in uranium ore. A stable isotope of lead is the end product of the series. 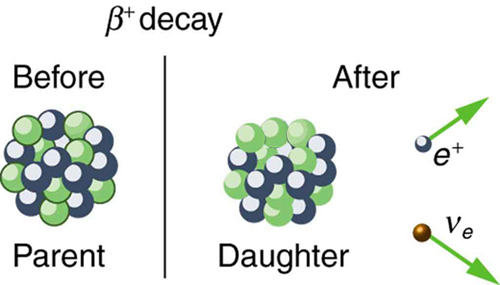 Note that the daughters of decay shown in Figure 1 always have two fewer protons and two fewer neutrons than the parent. This seems reasonable, since we know that decay is the emission of a nucleus, which has two protons and two neutrons. The daughters of decay have one less neutron and one more proton than their parent. Beta decay is a little more subtle, as we shall see. No decays are shown in the figure, because they do not produce a daughter that differs from the parent. Figure 2. Alpha decay is the separation of a 4He nucleus from the parent. The daughter nucleus has two fewer protons and two fewer neutrons than the parent. Alpha decay occurs spontaneously only if the daughter and 4He nucleus have less total mass than the parent. where Y is the nuclide that has two fewer protons than X, such as Th having two fewer than U. So if you were told that decays and were asked to write the complete decay equation, you would first look up which element has two fewer protons (an atomic number two lower) and find that this is uranium. Then since four nucleons have broken away from the original 239, its atomic mass would be 235. Here, is the nuclear reaction energy (the reaction can be nuclear decay or any other reaction), and is the difference in mass between initial and final products. When the final products have less total mass, is positive, and the reaction releases energy (is exothermic). When the products have greater total mass, the reaction is endothermic ( is negative) and must be induced with an energy input. For decay to be spontaneous, the decay products must have smaller mass than the parent. Find the energy emitted in the decay of . Nuclear reaction energy, such as released in α decay, can be found using the equation . We must first find , the difference in mass between the parent nucleus and the products of the decay. This is easily done using masses given in Appendix A. The energy released in this decay is in the range, about times as great as typical chemical reaction energies, consistent with many previous discussions. Most of this energy becomes kinetic energy of the particle (or nucleus), which moves away at high speed. The energy carried away by the recoil of the nucleus is much smaller in order to conserve momentum. The nucleus can be left in an excited state to later emit photons ( rays). This decay is spontaneous and releases energy, because the products have less mass than the parent nucleus. The question of why the products have less mass will be discussed in Chapter 31.6 Binding Energy. Note that the masses given in Appendix A are atomic masses of neutral atoms, including their electrons. The mass of the electrons is the same before and after αα decay, and so their masses subtract out when finding . In this case, there are 94 electrons before and after the decay. The neutrino is a particle emitted in beta decay that was unanticipated and is of fundamental importance. The neutrino was not even proposed in theory until more than 20 years after beta decay was known to involve electron emissions. Neutrinos are so difficult to detect that the first direct evidence of them was not obtained until 1953. Neutrinos are nearly massless, have no charge, and do not interact with nucleons via the strong nuclear force. Traveling approximately at the speed of light, they have little time to affect any nucleus they encounter. This is, owing to the fact that they have no charge (and they are not EM waves), they do not interact through the EM force. They do interact via the relatively weak and very short range weak nuclear force. Consequently, neutrinos escape almost any detector and penetrate almost any shielding. However, neutrinos do carry energy, angular momentum (they are fermions with half-integral spin), and linear momentum away from a beta decay. When accurate measurements of beta decay were made, it became apparent that energy, angular momentum, and linear momentum were not accounted for by the daughter nucleus and electron alone. Either a previously unsuspected particle was carrying them away, or three conservation laws were being violated. Wolfgang Pauli made a formal proposal for the existence of neutrinos in 1930. The Italian-born American physicist Enrico Fermi (1901–1954) gave neutrinos their name, meaning little neutral ones, when he developed a sophisticated theory of beta decay (see Figure 3). 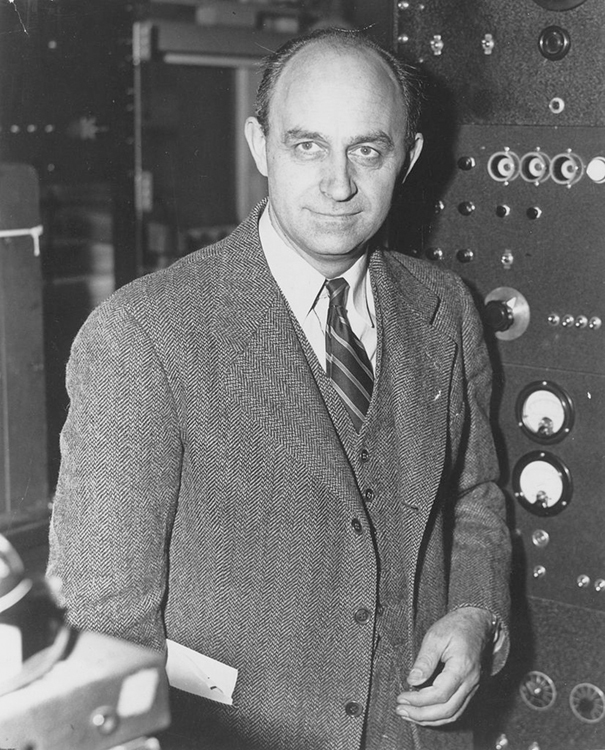 Part of Fermi’s theory was the identification of the weak nuclear force as being distinct from the strong nuclear force and in fact responsible for beta decay. The neutrino also reveals a new conservation law. There are various families of particles, one of which is the electron family. We propose that the number of members of the electron family is constant in any process or any closed system. In our example of beta decay, there are no members of the electron family present before the decay, but after, there is an electron and a neutrino. So electrons are given an electron family number of . The neutrino in decay is an electron’s antineutrino, given the symbol , where is the Greek letter nu, and the subscript e means this neutrino is related to the electron. The bar indicates this is a particle of antimatter. (All particles have antimatter counterparts that are nearly identical except that they have the opposite charge. Antimatter is almost entirely absent on Earth, but it is found in nuclear decay and other nuclear and particle reactions as well as in outer space.) The electron’s antineutrino , being antimatter, has an electron family number of . The total is zero, before and after the decay. The new conservation law, obeyed in all circumstances, states that the total electron family number is constant. An electron cannot be created without also creating an antimatter family member. This law is analogous to the conservation of charge in a situation where total charge is originally zero, and equal amounts of positive and negative charge must be created in a reaction to keep the total zero. Figure 4. In β− decay, the parent nucleus emits an electron and an antineutrino. The daughter nucleus has one more proton and one less neutron than its parent. Neutrinos interact so weakly that they are almost never directly observed, but they play a fundamental role in particle physics. We see that charge is conserved in decay, since the total charge is before and after the decay. For example, in decay, total charge is 27 before decay, since cobalt has . 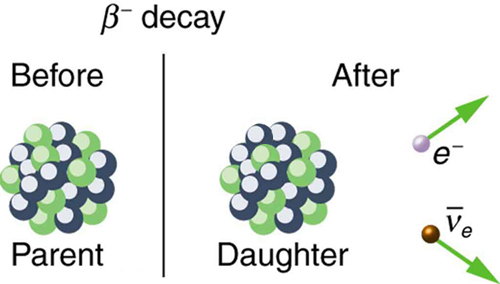 After decay, the daughter nucleus is Ni, which has , and there is an electron, so that the total charge is also or 27. Angular momentum is conserved, but not obviously (you have to examine the spins and angular momenta of the final products in detail to verify this). Linear momentum is also conserved, again imparting most of the decay energy to the electron and the antineutrino, since they are of low and zero mass, respectively. Another new conservation law is obeyed here and elsewhere in nature. The total number of nucleons is conserved. In decay, for example, there are 60 nucleons before and after the decay. Note that total is also conserved in decay. Also note that the total number of protons changes, as does the total number of neutrons, so that total and total are not conserved in decay, as they are in decay. Energy released in decay can be calculated given the masses of the parent and products. Perhaps the most difficult thing about this example is convincing yourself that the mass is included in the atomic mass of . Beyond that are other implications. Again the decay energy is in the MeV range. This energy is shared by all of the products of the decay. In many decays, the daughter nucleus is left in an excited state and emits photons ( rays). Most of the remaining energy goes to the electron and neutrino, since the recoil kinetic energy of the daughter nucleus is small. One final note: the electron emitted in decay is created in the nucleus at the time of decay. The second type of beta decay is less common than the first. It is decay. Certain nuclides decay by the emission of a positive electron. This is antielectron or positron decay (see Figure 5). Figure 5. β+ decay is the emission of a positron that eventually finds an electron to annihilate, characteristically producing gammas in opposite directions. since we use the masses of neutral atoms. Any nuclide that can decay can also undergo electron capture (and often does both). The same conservation laws are obeyed for EC as for decay. It is good practice to confirm these for yourself. All forms of beta decay occur because the parent nuclide is unstable and lies outside the region of stability in the chart of nuclides. Those nuclides that have relatively more neutrons than those in the region of stability will decay to produce a daughter with fewer neutrons, producing a daughter nearer the region of stability. Similarly, those nuclides having relatively more protons than those in the region of stability will decay or undergo electron capture to produce a daughter with fewer protons, nearer the region of stability. These are called cobalt rays, although they come from nickel—they are used for cancer therapy, for example. It is again constructive to verify the conservation laws for gamma decay. Finally, since decay does not change the nuclide to another species, it is not prominently featured in charts of decay series, such as that in Figure 1.
, and decay. Spontaneous fission is the most important of the other forms of nuclear decay because of its applications in nuclear power and weapons. It is covered in the next chapter. is a high-energy photon originating in a nucleus. 1: Star Trek fans have often heard the term “antimatter drive.” Describe how you could use a magnetic field to trap antimatter, such as produced by nuclear decay, and later combine it with matter to produce energy. Be specific about the type of antimatter, the need for vacuum storage, and the fraction of matter converted into energy. 2: What conservation law requires an electron’s neutrino to be produced in electron capture? Note that the electron no longer exists after it is captured by the nucleus. 3: Neutrinos are experimentally determined to have an extremely small mass. Huge numbers of neutrinos are created in a supernova at the same time as massive amounts of light are first produced. When the 1987A supernova occurred in the Large Magellanic Cloud, visible primarily in the Southern Hemisphere and some 100,000 light-years away from Earth, neutrinos from the explosion were observed at about the same time as the light from the blast. How could the relative arrival times of neutrinos and light be used to place limits on the mass of neutrinos? 4: What do the three types of beta decay have in common that is distinctly different from alpha decay? In the following eight problems, write the complete decay equation for the given nuclide in the complete notation. Refer to the periodic table for values of . 1: decay of (tritium), a manufactured isotope of hydrogen used in some digital watch displays, and manufactured primarily for use in hydrogen bombs. 2: decay of , a naturally occurring rare isotope of potassium responsible for some of our exposure to background radiation. 5: Electron capture by . 6: Electron capture by . 7: decay of , the isotope of polonium in the decay series of that was discovered by the Curies. A favorite isotope in physics labs, since it has a short half-life and decays to a stable nuclide. 8: decay of , another isotope in the decay series of , first recognized as a new element by the Curies. Poses special problems because its daughter is a radioactive noble gas. In the following four problems, identify the parent nuclide and write the complete decay equation in the notation. Refer to the periodic table for values of . 9: decay producing . The parent nuclide is a major waste product of reactors and has chemistry similar to potassium and sodium, resulting in its concentration in your cells if ingested. 11: decay producing . The parent nuclide is nearly 100% of the natural element and is found in gas lantern mantles and in metal alloys used in jets ( is also radioactive). 12: decay producing . The parent nuclide is in the decay series produced by , the only naturally occurring isotope of thorium. 13: When an electron and positron annihilate, both their masses are destroyed, creating two equal energy photons to preserve momentum. (a) Confirm that the annihilation equation conserves charge, electron family number, and total number of nucleons. To do this, identify the values of each before and after the annihilation. (b) Find the energy of each ray, assuming the electron and positron are initially nearly at rest. (c) Explain why the two rays travel in exactly opposite directions if the center of mass of the electron-positron system is initially at rest. 14: Confirm that charge, electron family number, and the total number of nucleons are all conserved by the rule for decay given in the equation . To do this, identify the values of each before and after the decay. 15: Confirm that charge, electron family number, and the total number of nucleons are all conserved by the rule for decay given in the equation . To do this, identify the values of each before and after the decay. 16: Confirm that charge, electron family number, and the total number of nucleons are all conserved by the rule for decay given in the equation . To do this, identify the values of each before and after the decay. 17: Confirm that charge, electron family number, and the total number of nucleons are all conserved by the rule for electron capture given in the equation . To do this, identify the values of each before and after the capture. 18: A rare decay mode has been observed in which emits a nucleus. (a) The decay equation is . Identify the nuclide . (b) Find the energy emitted in the decay. The mass of is 222.015353 u. 19: (a) Write the complete decay equation for . (b) Find the energy released in the decay. 20: (a) Write the complete decay equation for . 21: (a) Write the complete decay equation for the neutron. (b) Find the energy released in the decay. 22: (a) Write the complete decay equation for , a major waste product of nuclear reactors. (b) Find the energy released in the decay. 23: Calculate the energy released in the decay of , the equation for which is given in the text. The masses of and are 21.994434 and 21.991383 u, respectively. 24: (a) Write the complete decay equation for . (b) Calculate the energy released in the decay. The masses of and are 11.011433 and 11.009305 u, respectively. 25: (a) Calculate the energy released in the decay of . (b) What fraction of the mass of a single is destroyed in the decay? The mass of is 234.043593 u. (c) Although the fractional mass loss is large for a single nucleus, it is difficult to observe for an entire macroscopic sample of uranium. Why is this? 26: (a) Write the complete reaction equation for electron capture by . (b) Calculate the energy released. 27: (a) Write the complete reaction equation for electron capture by . (c) The two rays must travel in exactly opposite directions in order to conserve momentum, since initially there is zero momentum if the center of mass is initially at rest. (c) Since U-238 is a slowly decaying substance, only a very small number of nuclei decay on human timescales; therefore, although those nuclei that decay lose a noticeable fraction of their mass, the change in the total mass of the sample is not detectable for a macroscopic sample. 31.4 Nuclear Decay and Conservation Laws by OpenStax is licensed under a Creative Commons Attribution 4.0 International License, except where otherwise noted.